Austin loves to celebrate any time of year through a variety of festivals and events, but the holiday season really shines at showcasing local celebrations, small businesses and family gatherings. Take a look at some of December&apos;s top events, and celebrate the season! 11/2812/24/14 Blue Genie Art Bazaar Marchesa Hall & Theatre: The Blue Genie Art Bazaar is a fixture of the Austin holiday shopping season. This event is an annual arts show that features unique work from more than 200 local and regional artists with a portion of proceeds going to Make-A-Wish Central & South Texas. It is a fun, free shopping event you can&apos;t miss! 12/5/14- 12/21/14 Holiday Wine Trail Austin Hill Country Wineries: Spend 10 days exploring the wineries of the Texas Hill Country during the 2014 Holiday Wine Trail event. Grab a ticket and get between 1 and 3 complimentary tastings per winery, a holiday ornament and discounts on local wines. 12/6/14- 12/23/14 Ballet Austin&apos;s The Nutcracker Long Center for the Performing Arts: Join the annual tradition with an army of mischievous mice, a bevy of bon-bons, a sprinkle of sparkling snowflakes, and Mother Ginger. 12/6/14 Holiday Sing-Along & Downtown Stroll Downtown Austin: Caroling in front of the Capitol before heading down Congress Avenue for live music and shopping! Austin&apos;s Zilker Tree. Photo by Austin Trail of Lights. 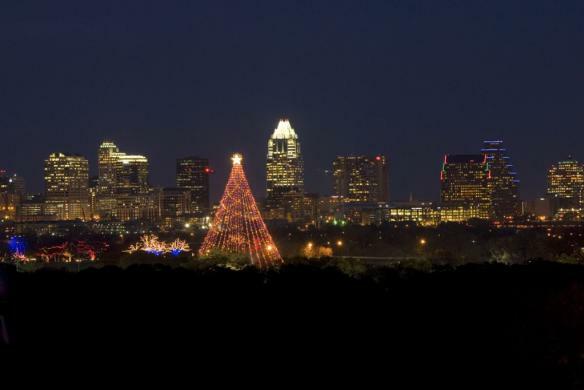 12/7/14-12/21/14 Trail of Lights and Zilker Tree Zilker Park: The Austin Trail of Lights lights up the season with a celebration of community, memories and fun. Located at Zilker Park, and fun for the whole family! 12/13/14- 12/14/14 Luminations Lady Bird Johnson Wildflower Center: Thousands of luminaries and twinkling lights turn the center into a holiday wonderland during Luminations! In addition to the beautiful holiday lighting, they&apos;ll have Frosty the Snowman, the Austin Banjo Club, the Chalameau Quartet, La Grosse Tete and the Eanes High School Choir, plus children&apos;s activities and holiday specials at the store. 12/16/24-12/24/14 Armadillo Christmas Bazaar Palmer Events Center: Shades of old Austin are reflected at this market with eclectic gift and local musical entertainment. 12/19/14- 01/04/15 Lights & Ice Omni Barton Creek Resort & Spa: Enjoy a 3,800- square-foot ice rink and 200,000 twinkling lights as the Omni Resort Pavilion turns into a winter wonderland. A portion of proceeds raised from the exhibit will be donated to the Make-a-Wish Foundation of Central & South Texas. 12/22/14 Bah Humbug! A One-Man Christmas Carol Dougherty Arts Center: Now in its 12th year, this is a Charles Dickens "A Christmas Carol" with an amazing twist. Check out this one-man performance of a powerful tale of hope and compassion! 12/25/14 Four Seasons Hotel Austin&apos;s Christmas Dinner Four Seasons Hotel Austin: Don&apos;t want to whip up dinner on this festive eve? Enjoy a Christmas feast with family and friends at Trio! 12/31/14 Austin&apos;s New Year Butler Park: Austin&apos;s New Year (ANY) is an annual free event where Austin families can come together downtown to welcome in the New Year! ANY is an alcohol-free celebration showcasing Austin&apos;s diverse and talented creative community through art, films, and live music. And kids and adults alike won&apos;t want to miss the exciting fireworks finale! What favorite events are you participating in this December? Let us know in the comments below!